90% of the world's flat glass is produced by the float glass process invented in the 1950s by Sir Alastair Pilkington of Pilkington Glass, in which molten glass is poured onto one end of a molten tin bath. The glass floats on the tin, and levels out as it spreads along the bath, giving a smooth face to both sides. The glass cools and slowly solidifies as it travels over the molten tin and leaves the tin bath in a continuous ribbon. The glass is then annealed by cooling in an oven called a lehr. The finished product has near-perfect parallel surfaces. A very small amount of the tin is embedded into the glass on the side it touched. The tin side is easier to make into a mirror. This "feature" quickened the switch from plate to float glass. The tin side of glass is also softer and easier to scratch. 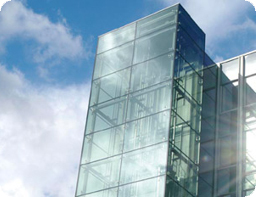 Glass is produced in standard metric thicknesses of 2, 3, 4, 5, 6, 8, 10, 12, 15, 19 and 22 mm. Molten glass floating on tin in a nitrogen/hydrogen atmosphere will spread out to a thickness of about 6 mm and stop due to surface tension. Thinner glass is made by stretching the glass while it floats on the tin and cools. Similarly, thicker glass is pushed back and not permitted to expand as it cools on the tin.